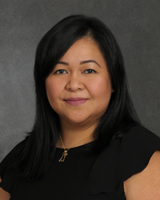 Professor Lani Blanco recently joined the Stony Brook University School of Nursing as Clinical Instructor where she will be teaching courses in the undergraduate program. As a nurse for over 14 years working in various critical care areas, her interest lies mainly with providing patients with quality holistic nursing care in order to achieve improved patient outcomes. Her program of scholarship is focused on transforming and enhancing nursing education through engaging students in their learning and empowering patients in their health care. She believes that the ability to provide patients with excellent, compassionate, and humanistic care begins in nursing education. She is particularly interested in integrating the humanities into nursing education, particularly by incorporating the creative arts to enhance nursing practice, as well as discovering the potential for technological innovations to influence health. Previously, she has held academic appointments at the College of New Rochelle School of Nursing and Adelphi University College of Nursing and Public Health. At present, she is in the process of completing a Doctor of Philosophy degree in Nursing at Adelphi University with an anticipated date of completion in 2017. Her dissertational research involves determining the associations between patient-empowering nurse behaviors and pain and functional outcomes following orthopedic surgery.